During 2014 SATO announced the End Of Life of the following barcode printers and their limited availability. At this time, inventory of these products have run their supply and SATO cannot fulfill any further orders placed for these models. 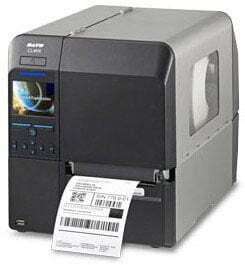 SATO does offer a direct replacement for these printers with the CL4NX series. SATO programming language (SBPL) compatibility making it a drop-in replacement. SATO emulations of competitive print languages on-board, user selectable. Standard Ethernet, USB, Serial and Parallel communication on the base model which lowers the cost from many previous models. 600m ribbon and 10-inch O.D. media that saves users time in changing media. Full color graphic display and intuitive navigation menus that improve usability and decrease training time. Tool-less service parts that keep the printer up and running, reducing downtime. With its advanced technology, yet uncomplicated operation and set up, we are confident you will discover the CL4NX to be an excellent replacement printer option for your customers. SATO will maintain their 5 year service commitment by supporting and servicing discontinued printers through our service center as long as parts are available.